For the first time in history, businesses spent more money advertising online than on broadcast television thanks to sharp growth in mobile and digital video ads, the Associated Press reports this week. According to a report from the Interactive Advertising Bureau, in 2013, Internet advertising revenue rose 17 percent to a record $42.8 billion. 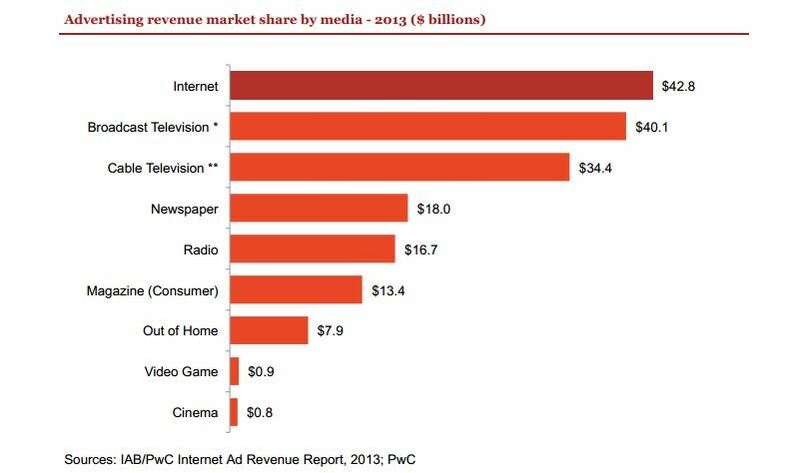 Broadcast television advertising, in comparison, was $40.1 billion in 2013. Mobile advertising revenue more than doubled to $7.1 billion from $3.4 billion in 2012 as companies like Facebook, Google and Twitter boosted their mobile presence, the report says. The report is based on a survey conducted by PricewaterhouseCoopers.